After much of Manhattan seized into gridlock, Governor Cuomo and Mayor Bloomberg jumped into action a day late this afternoon with a transportation plan for New Yorkers. Even with the combination of HOV-3 restrictions, partially restored subway service and special bus routes ready for tomorrow morning’s commute, most New Yorkers will discover that — like today — their bike provides the fastest one-seat ride in the city. 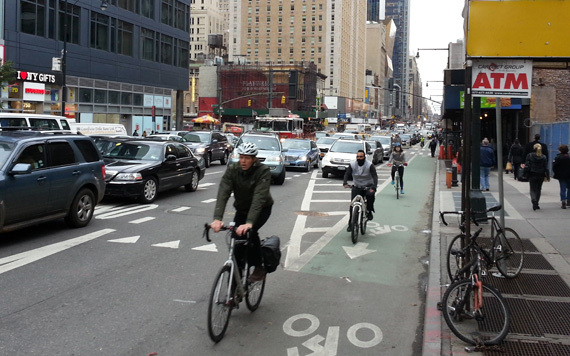 Protected bike lanes throughout Manhattan were a blessing for bike riders today, who did not have to fight with gridlocked cars to keep moving, at least where the lanes have been installed. Tomorrow morning from 8 to 11 a.m., Transportation Alternatives will host After-Sandy Commuter Support Stops for bike commuters at the Williamsburg Bridge, Manhattan Bridge, Queensboro Bridge and 26th Street at 6th Avenue, where volunteers and staff will be offering coffee, route guidance and assistance to riders. Tomorrow evening from 5 to 7 p.m., the support stops will be available at 2nd Avenue and 9th Street at Veselka Restaurant, 5th Avenue and 25th Street, the Manhattan Bridge and the Williamsburg Bridge. The West Side Greenway in Midtown was being used by joggers and bicycle riders this afternoon, though neither the New York City Parks Department, which manages the path north of 59th Street, nor the New York State Office of Parks, Recreation and Historic Preservation, which manages the park south of 59th Street, said it was officially open. However, Riverbank State Park, adjacent to the path on the Hudson River between 138th and 145th Streets, is one of three state parks that is officially open. The other two open state parks are East River State Park in Williamsburg and Gantry State Park in Long Island City. If you are thinking of riding tomorrow but are unsure of the rules of the road, take a look at these tips from Dani Simons and DOT’s Bike Smart guide. You may also want to take a look at a list of bike shops that are open post-Sandy compiled by Brooklyn Spoke. Anybody know the status of the East side greenway? What about the west side path from 14th st northward? I’ll be out there bright and early tomorrow. Don’t forget to bundle up, it’s a little chilly out there! Don’t forget lights! To reach the Brooklyn-bound bridges you’ll be riding home through parts of the city that still don’t have electricity. my plan is to take my bike on the ferry from jersey city to 34th st and ride to the uws and then down to the village (and then back uptown again and then back to the ferry- i’m a dogwalker)- i sure hope there’s room on the ferry for my bike! The biggest problems I encountered on my ride to work today were delivery trucks out doing two or three days’ worth of work in one and all the small debris on the sides of the roads. People in cars seemed a tiny bit warier than usual–a little surprised, it seemed, to simply be able to move at all. That will probably come tomorrow morning. 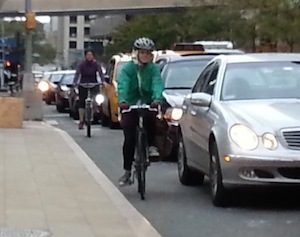 I rode up 8th Avenue this evening, and there was actual bike traffic! (Of course, nothing compared to the motor vehicle gridlock) I’d say the number of cyclists I saw was about four times the usual amount. An interesting consequence was that the protected bike lane in midtown was mostly clear, compared to its usual state of being full of pedestrians who treat it as an extension of the sidewalk. It make sense: people normally think “why not walk on this “empty” bike lane?”, but when, as today, they see a cyclist zipping by every few seconds, it is much less tempting to treat it as a sidewalk. I loved riding in the parts of the city that had no power today. You could pretty much go straight through on 1st Ave as if it were a greenway. Cars there seemed wary to drive aggressively and there was very little cross-street traffic. Delancy, 34th, and 42nd Sts also had traffic cops controlling traffic. Above 42nd St, it was complete chaos though (especially on the part of 1st Ave without a dedicated bike lane) as I had to basically weave through in between cars that were practically parked there (at least I didn’t see any cars moving faster than 2 mph). I rode the West Side Greenway from 88th Street down to the Battery and back this evening. It all appeared to be open and there were many cyclists heading north, although I had to access the path through an officially closed Riverside Park. Returning after dark in the southern section where the power is out was hairy — the lights of the oncoming cars blind you and there is no other light to compensate. I rode verrrrry slowly. Thanks for this informative post. I’ll be riding from Brooklyn (Kensington) to West 106th Street tomorrow and I’m very glad to know that the West side greenway is accessible. And a good reminder to bring extra lights! It will be exciting to see lower Manhattan without power in the evening. The East Side Greenway was messy but passable when I rode it on Tuesday. There were trees down in sections but you could detour around them. It’d be tricky on a road bike but OK on anything with meatier tires. The only way we can stop climate change which caused this mess we have gotten ourselves into is to ban cars where ever they are not absolutely necessary, and continue to advance & deploy net zero vehicles & systems to levels of practicality & functionality that far surpass those of cars which is completely achievable. Banning cars is not unlike banning cigarettes. And rapid advancement & deployment of technology to meet a crisis in not unlike the banning of the manufacture of cars after Pearl Harbor for nearly 3 years to produce quantities of war machinery never dreamt possible. How ironic that they are now prototyping Bikeshare in the Brooklyn Navy Yard. Yes, fellow cyclists, please get some lights! The number people riding through a pitch dark Manhattan last night with no lights was astounding. The eastside greenway was blocked this afternoon at 90th st by construction – looked like serious repair work. Sandy Aftermath: Where Would You Reserve More Space for Buses and Bikes? Two weeks ago, Streetsblog sent four open-ended questions to the candidates in eight contested City Council races. We'll be publishing the responses we received, as well supplementary material from StreetsPAC questionnaires, in a series of posts this afternoon.